An assortment of L&M cigarettes sold in the United States. Created by the company Liggett & Myers in 1953, L&M is a brand of cigarettes produced by Altria Group, Inc. (previously known as Philip Morris Companies, Inc.). "L&M" is one of the earliest, perhaps the earliest brand to have a filter that was not a one sided filter. When the "L&M" brand was launched, their motto was American cigarettes of the highest quality with the best filter. When their success in the American market was solidified, Liggett Group made a proposal to take the "L&M" international. The brand is popular in Latin America, central and northern Europe, the Arab World and the far east and south Asia. They were not very common in the continental US until a new roll out made them available in October 2007, and are still not very popular in the United Kingdom. According to the information of the independent agency of field investigation "Business Analytics", the second quarter of 2007, Phillip Morris brands took the first place in 25 Russian cities with a market share of 29.92%. During the press conference, it was reported that "L&M" takes third place in the world by sales volume. 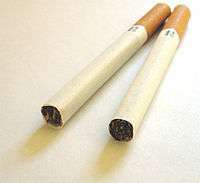 Also, the "L&M" brand second place among other cigarette brands produced by Phillip Morris International. Due to new labeling regulations in Europe banning the use of the word 'lights' names of some cigarette brands have been changed, e.g., L&M Lights are now L&M Blue Label. The same happened in 2010 in the U.S. when the Food and Drug Administration (FDA) banned flavor descriptors—such as "mild," "light" and "ultra light"—even though the color designations were already changed like in Europe. 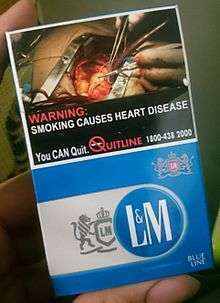 Cigarette pack of L&M Blue in Singapore, with a big warning sign. Wikimedia Commons has media related to L&M.